These cunning carnivores also possess shearing carnassial teeth for tearing and eating flesh. They are stand up, tenacious, lethal hunters and will readily take on animals of much greater size. Interesting, year-round highlights of the marten’s coat include dark chocolate to medium brown fur, with beige or orange throat patches and a tan face. This combination creates deceptive images in the shadows of the tree canopy. Their tough and slinky bodies are wire-like in form and power. The marten’s ability to rotate its hind limbs to facilitate descending trees head first helps in hunting prey. Amazingly, martens chase pine squirrels from tree to tree, hurling themselves with the aid of their tail into an S-shaped pattern which propels them the extra few feet they need to secure their target. Although the North American River Otter is a gregarious, fun loving mustelid often called the clown of the woods, one must respect their hunting abilities! Its sinuous, torpedo-shaped body is propelled by webbed paws and strong limbs combined with vertical undulations of its slender, long tail. The dense fur is a rich brown above, with seal grey or silvery fur below. This provides a natural camouflage. With nostrils and ears closed, these submariners utilize an ambush attack strategy, at times working in groups. Long, stiff facial whiskers can help detect movement of prey such as fish, crustaceans, small mammals, reptiles, and birds. Look for slides, rolls, tail drag, and latrines. May be found miles from water, and is preyed upon by cougar, bobcat, coyotes, and wolves. 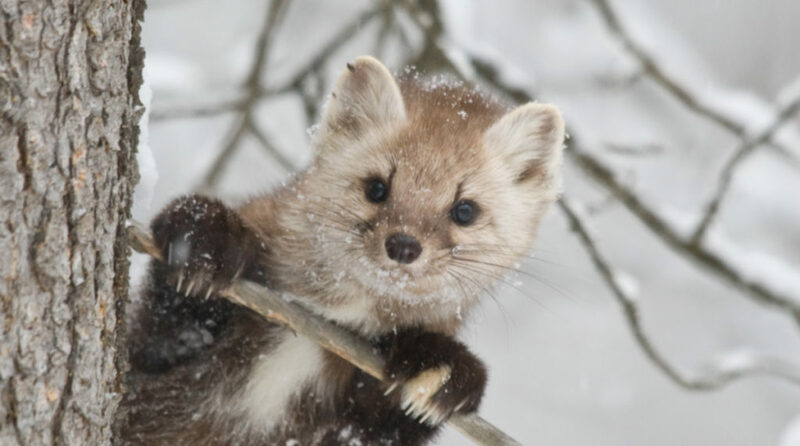 Sporting a winter-white camouflage, this mustelid’s long tail is an aid in vertical stances at the base of trees, or in horizontal posture along tree branches as it pursues small mammals and birds. A fearless and stealthy hunter, these weasels cache prey; this food storage limits obesity. This tactic enables both larger males and smaller females to enter the burrows of voles, shrews, and rodents. Their prey is never safe, whether aboreal, terrestrial, or sub-nivean; that is, under the snow. This generally nocturnal, solitary, semi-aquatic forager is cloaked in a rich dark brown to almost black, dense pelage which both protects it from cold mountain waters and conceals its presence. 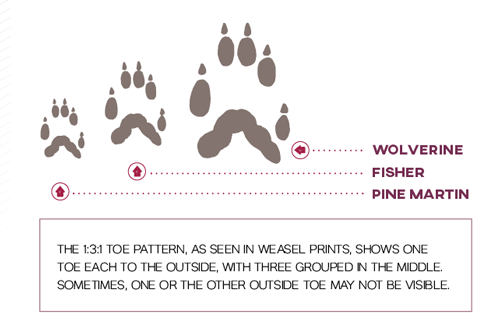 Look for this mustelid’s tiny, 1.5- to 2-inch tracks in the typical 1:3:1 weasel toe pattern along the water’s edge. Scatologically speaking, search for long slender cords folding back along itself, often black, with tapered ends and a strong, musky odor. The mink’s tubular-shaped body and dorsoventrally flattened head (each side looks different) enable it to swim like a bullet and surprise prey! In this way fish, frogs, birds, shrews, ducks and muskrats are taken. Mink will often utilize dens of other animals. Diversity is a key strategy employed by this mid-sized member of the weasel family erroneously named the fisher! The misnomer is attributed to original Dutch settlers who used the word fisse, and the French trappers who related their word fichet to this mustelid that to them resembled the European polecat. It is generally accepted that fisher do not harvest fish, unless, perhaps, incidentally. This aboreal and terrestrial hunter has blackish brown fur with lighter highlights that camouflages it in trees and on the ground. Fisher often use cat-like screams to intimidate prey such as snowshoe hare, small mammals and birds. It is a specialized predator of porcupines, utilizing retractable claws and a head/eye attack to wear down its prey, eventually eviscerating the porcupine through its soft belly. Prolific scent marking reduces competition for food by discouraging other predators from hunting in their territory. Keys to survival strategies of wolverine include physical toughness, tenacity, intelligence, and cunning. Symbols of the essence of wildness, this largest terrestrial member of the weasel family is compactly built, and presents a formidable foe! Its dense fur is medium brown to blackish with two broad beige stripes running from shoulders to rump. It has a broad, flat head with whitish markings, strong fangs that tear through flesh, powerful jaws to masticate through bone, and long, thick, non-retractable claws. This somewhat solitary stalker of the higher country employs selective adaptability and seasonal availability into home ranges of roughly 400 square miles. Hunting trips of 25 miles are not uncommon, and males in search of mates may wander widely. Milder season diets may include rodents, marmots, snowshoe hare, porcupines, grouse, ptarmigan, and berries. In deep snow, they prey upon young moose, caribou, elk, bighorn sheep, mountain goats, and consume carrion. Bears, wolves, and cougar may prey upon wolverines, but know they are in for a formidable challenge! 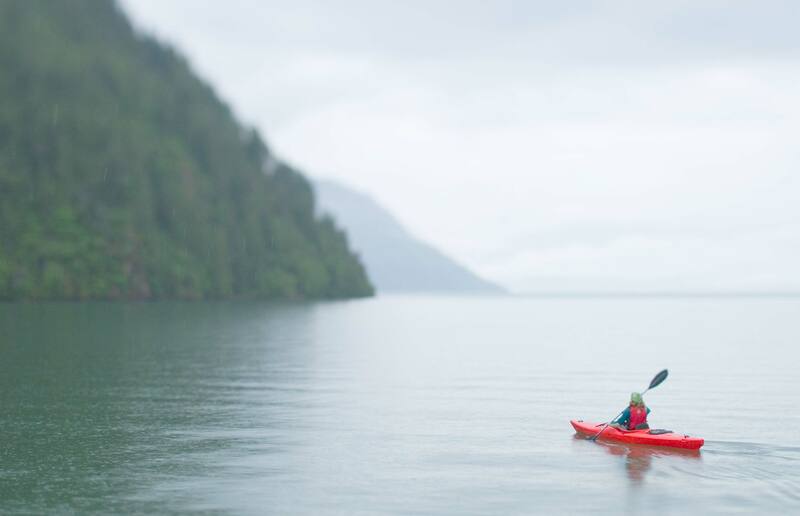 Baxter instructs outdoor educational classes for diverse groups including North Idaho College, Friends of Scotchman Peaks Wilderness, Project Ascent, Glacier Bicycle Adventure Tours, numerous educational institutions, and conservation groups. Contact him for a schedule or to plan a program at: [email protected] or 406-291-2154.